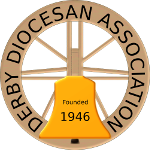 We are a group of about 650 bell ringers in Derbyshire (or the Diocese of Derby) who meet to ring and socialise together, give support and training, promote bell ringing and provide bell ringing advice. The association is split into 4 districts: Central, Chesterfield, Peak and Southern, and is affiliated to the Central Council of Church Bellringers. Our young ringers have an all-ability group called Derbyshire Young Ringers who meet monthly and enter a team the annual Ringing World National Youth Contest. Individual towers arrange their own ringing for services, weddings, special occasions and for practice. Use of our Wombel – a portable demonstration and training bell – contact EdSec@derbyda.org.uk. Public relations advice – contact PRO@derbyda.org.uk. Providing extra ringers to help at your practice, perhaps to help teach handling or Plain Hunt or to help ring a particular method – contact your District Education Representatives: Gill Hughes (Central), Andrew Hall, Karen Jeffrey] (Chesterfield), Josephine Walker (Peak), Jenny Halliday, Rachael Peckham (Southern). Insurance cover – see the Insurance page. Advice on all aspects of bell maintenance, from regular checks to repairs – contact the Bell Consultants: Mike Banks, Robin Lyon. Providing extra ringers to help you to ring for a special service, occasion or wedding – contact your District Secretary: Sue French (Central), Jeanette Fisher (Chesterfield), Glen Fiddy (Peak), Alison Barnett (Southern).